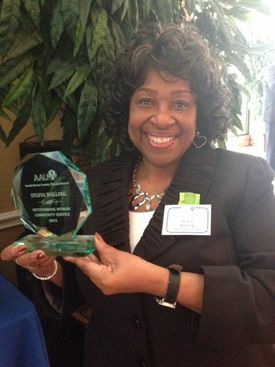 Sylvia Bolling has been awarded as the Outstanding Woman of 2015 in the area of Community Service by the NHC American Association of University Women. Their awards luncheon was held on Saturday, February 28th at Shirley Acres. When Sylvia Bolling realized that the Aldine area offered few after-school activities for students, she began to offer recreation, education, encouragement, and hope for them. She began Aldine Y.O.U.T.H. in 1990 out of her home, spent the first 5 years operating with no facility, staff, and very limited funds, but was determined to make a positive difference. Dedicated volunteers helped establish the grassroots organization and were able to accomplish many good works for the community. In 1995, the Aldine YOUTH Community Center was established offering over 20+ programs and services to help transform youth and their families. In March 2012, the Center was acquisitioned by Buckner International and is now the Aldine Family Hope Center, continuing to offer valuable programs and services for our youth and families. The other awardee was Grace England for her work in the field of education. Dr. Theresa Kurk McGinley, Acting Associate Vice Chancellor of International Programs for Lone Star College was the keynote speaker. Over 200 people attended this event. NHC-AAUW’s mission is to advance equity for women and girls through advocacy, education, philantrophy, and research. Sylvia is very humbled by this award and thanks everyone who has supported over the years. Shawna Roy, Director, invites you to be a part of the Aldine Family Hope Center, 4700 Aldine Mail Rt., by becoming a member, volunteering, and/or donating. For more information, please visit the Center or call 281-449-4828 and visit Buckner’s website at www.buckner.org .